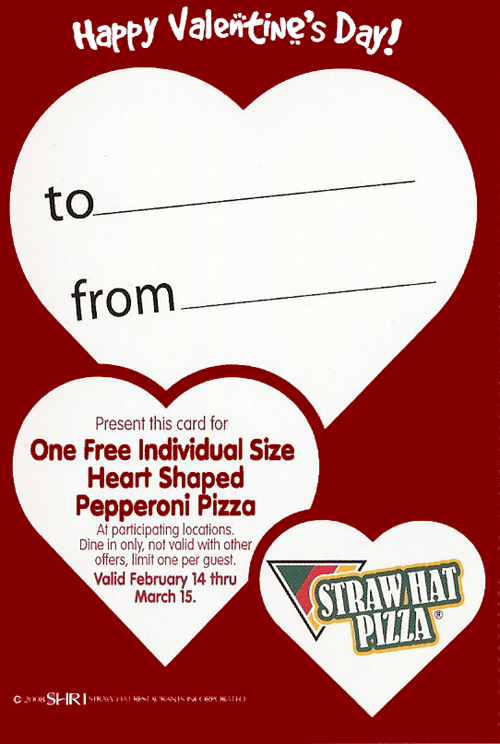 See the original article at this link: "Santa Maria Sees The Light"
Give the gift of great food to a loved one with Straw Hat Pizza's Valentine's Day card granting the one you favor a FREE Individual "Heart-Shaped" 1-topping Pizza. Purchase one today for ONLY $1 or 6 for $5. They are sure to please. Contact your local Straw Hat Pizza for complete details. Elementary School Teachers to Share the Love and Valentine’s Day Cards Good for a Heart-shaped Personal Pizza with Nearly Half a Million Students. Straw Hat Pizza, the original California Pizza since 1959, shared their love today as they donated nearly half a million (450,000) Valentine’s Day cards, for the fourth year in a row, to elementary school teachers to give students and offers a complimentary heart-shaped personal pizza from the popular pizza chain. Straw Hat Pizza hand delivers colorful Valentine’s Day cards (approximately 300 per school), to elementary schools within a 3-mile radius of all 72 Straw Hat Pizza locations (for students 13 years old or under) each February. “The fun valentine cards are intended for teachers to share the love with their students and reward positive behavior and achievements,” said Jonathan Fornaci, president, Straw Hat Pizza. Straw Hat Pizza has a long track record of community relations along with donating Valentine’s Day cards to area elementary schools each February. Pizza tours and fundraisers for kids and families have been part of the 51 year old pizza brand through the years providing both fun and educational experiences and of course pizza eating! Besides community relations and great service, Straw Hat Pizza has been making waves and fresh genuine California pizza since 1959. Using California vine-ripened tomatoes and local produce, hand-shredded cheeses and dough fresh rolled daily, their pizza is second to none. With Gourmet Masters Pizzas, Hot Hat Stuffed Sandwiches, and a garden fresh Salad Bar, guests have been enjoying the food as well as the family-friendly atmosphere for more than five decades. Today, 51 years later, Straw Hat Pizza is still making waves and Genuine California Pizza with the freshest ingredients. It’s not a trend, it’s a history as genuine as our California pizza. Straw Hat Pizza has opened several new California locations in recent months in San Ramon, Fairfield, Fresno, and Apple Valley. Besides the new California locations, the 51 year old company is growing with new locations opening in Arkansas, Florida, Illinois, Montana, New Jersey, New York and Texas. Growth plans to reach 150 locations within two years. For more information please visit: strawhatpizza.com and please follow us on Facebook & Twitter @StrawHatPizza.